Do you think you've seen all? OPPO smartphone is here to convince you, infact you wont love to buy another phone. OPPO has started it A series smaartphone which has gone viral on media though it was rumoured by finally it has been made clear that by 13th of July one of the A series will be release "A5". If you are following us strictly you'll noticed we posted about the OPPO Find X that comes with pop up 3D camera and some other enticing features. Currently OPPO is not keeping it hand on the desk to have attained, OPPO A5 is the prove as the deal day is fixed to be July 13th. You have to know what you're waiting for , the specs is really captivating, now just before we talk about it full specs. OPPO A5 comes with 6.2 inch full HD+ notch display and AI selfie camera. OPPO A5 has a full screen display protected by a layer of the 2.5D curved glass. Nothing to doubt about it display, it has full wide screen for it users, especially those that love to play game and watch movies giving you full screen like HD TV. 6.2 inch HD+ notch display as said earlier with 19:9 aspect ratio for the display cutout. Are you reasoning about the speed and performance? Oh nothing to reason about, OPPO A5 give you the best performance powered by 1.8GHz octa-core Qualcomm Snapdragon 450 SoC backed by Adreno 506 GPU. OPPO A5 is not only having good processor speed also backed by 4GB of RAM and 64GB storage and also support expansion using SD Card. Nothing should be expected less than the latest Android 8.1 Oreo with the specs and features embeded. OPPO A5 comes with best dual camera setup on the back featuring a f/2.2 13-megapixel primary sensor backed by a f/2.4 2-megapixel secondary camera. 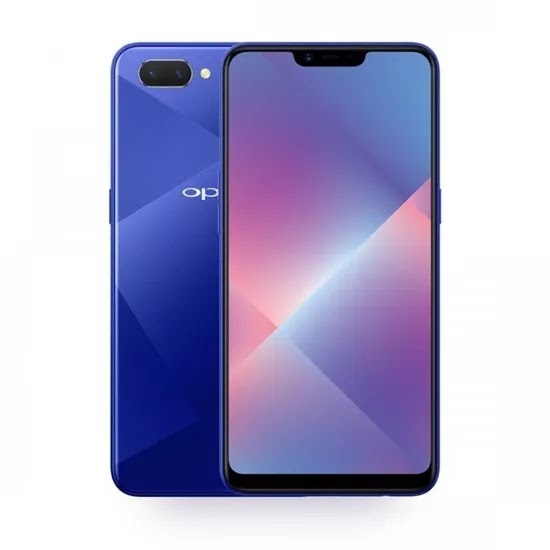 OPPO A5 is currently in two colour according to report from china which are Mirror Blue and Mirror Pink for now never know what may happen tomorrow. Nothing hidden about the date, it has been on rumour for long and finally we have the date to be July 13th, 2018, so if you are aiming to get one, be ready to welcome OPPO A5 this week. OPPO A5 has been equipped with a 4,230mAh battery so nothing to fear about taking you up 14hours of video playback or 11 hours of gaming on a single charge.